Oh certainly; when some additional stuff unlocks I'll be updating courses with ideas I couldn't fit in at the time (like a hidden 1-up block in 1-1 as an homage to the original). And thanks for the feedback, my entire intention is to make something that feels like it would fit right in with a "real" Mario game of its time, only remixed so it's different enough to feel new. I'm still not satisfied with 1-2, it needs more work, but the battery on my pad died so it's charging now. The higher-capacity replacement battery I ordered from Nintendo can't get here fast enough! So, uh, I thought the unlocks were gonna come faster. Still stuck waiting 9 days for everything? I think they changed it so that more time spent in the editor will unlock content faster. For example, I put in somewhere between 1-2 hours tonight already and the day 2 stuff unlocked sometime in there. If you haven't gotten it yet, the 10 Mario Challenge "Coinicopia" is a delight. Uploaded a level named "Turtle Stomp". Didn't get the ID. Can you search via Friends? Whatever. I was largely messing around and the only thing I wish for is to be able to adjust how high or low the winged koopas float. Will make some updates later, after I've unlocked more. Loving the Mario Paint music and easter eggs. f*cking fantastic. I haven't unlocked the 10 Mario Challenge yet. Looking forward to it though. 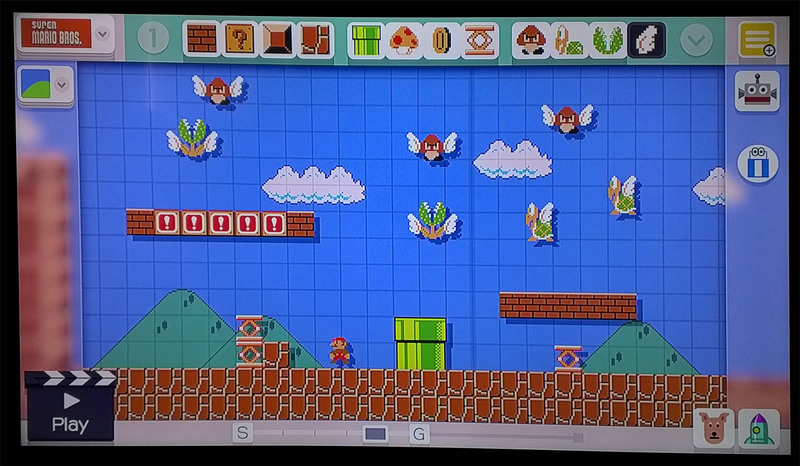 I jus tmade my first basic level in Mario maker, and holy crap, even building is fun. I kept it simple and didn't make something stupid hard. I do have more ideas though for when new items are unlocked. By accident, I realized you can stack goombas on top of each other like a pillar, and they'll stay that way and walk around. It reminds me of those things in Super Mario World. It's fun simply trying to put items on other items, shaking things, and seeing what happens. If you want to move big pieces of your level around, hold down L or R.
If you want to copy something you've already created, hold down ZL or ZR. Press Select (-) to start playing your level from the starting point. Click the left thumbstick to change the hand that displays on the TV while you're designing. Click the right thumbstick to cycle through left-handed options! To play a set of four of your own levels as a "world", save them in Coursebot into the same row in the order you want to play them in. Then, open the Main Menu and tap the Coursebot icon. It's in the lower left. If you have four courses on the same row, a play button will appear next to them on the Coursebot page. Tap it to play through those levels contiguously. Tap and hold over a level's icon in Coursebot to move it to a different world or slot in the same world. Ooh! Ooh! Please try out my level! 9864-0000-001C-3B33. Some surprises in there if you want to look for them! I picked mine up this morning, got a disinterested "what's that?" from the wife and kids. Showed them the 7 minute intro video (I think from this thread). Now I'm being pestered to hurry up and finish my chores so we can go upstairs and build "some Marios". That hard cover art book in the Limited Edition is just gorgeous! I finally succumbed and bought an amiibo when I bought my copy. Couldn't resist Zero Suit Samus, though the pose is bad and $13 is too expensive. It's too bad the costumes aren't in all graphic sets; maybe someday. Farscry, I gave your 1-1 a spin. Nice work! Damnablebear, I'll have to give yours a play in the morning. I'm already up too late! Edit: I ended up playing it, and I had fun. I liked what you did with having the player jump over the piranha plants then climb back above them to clear them out. I'm glad I have one. Even with it, I completely drained the gamepad tonight. is it maybe going to be worth compiling peoples level codes somewhere? At the moment we're having a Mario-fest. One of my Daughters is making a level for the other one, and while the first one is waiting to play the 'made' level, they are playing Mario 3D Land on their 3DS. I'm going to play some of the levels posted in this thread next week and hopefully have the time to create some of my own. I know they cop a LOT of flak, but as with Yarn Yoshi, the integration here is awesome (and not merely an afterthought). Drop in Samus, when she sprints, she converts to a MorphBall and flies across the screen. Pop Pacman on the Pad, and when the sprint kicks in watch as 'he' transforms into a flat pellet munching pizza circle, 'minus a slice'. Megaman throws his arms up in 'classic' fashion as he leaps between platforms. Drop Sonic into your Mario-verse, apart from being one of the signs of impending apocalypse, hit the sprint button and he curls up like a champion into the spindash position as the velocity ramps up. So far, we've also had Pikachu and Charizard belting around the screen too, so it's nice to see that the Pokemon license hasn't kept those characters out of this one (as I'm assuming it did with Yarn Yoshi). 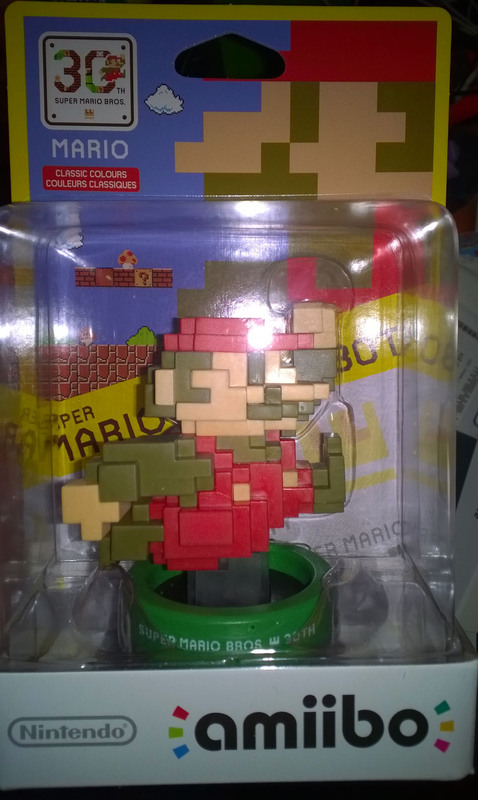 I haven't opened my 30th anniversary Mario yet, as the backing card is so nice looking, I really don't want to wreck it (to the point of irrationally considering buying another Amiibo of him). Haha, I put a Wario block in the 'THANK YOU' but it's in the 'A', so no one can actually get it. I might change it, but not sure if it's worth changing the level code at this point. Also, thank you guys! I had fun making it - took about an hour. I had to do a few tests with the length of the jumps, but the shocking thing was, those coin trails - they were a total guess based on what I know of Mario's running-jump distance. Turns out the trajectory was spot on... wtf. 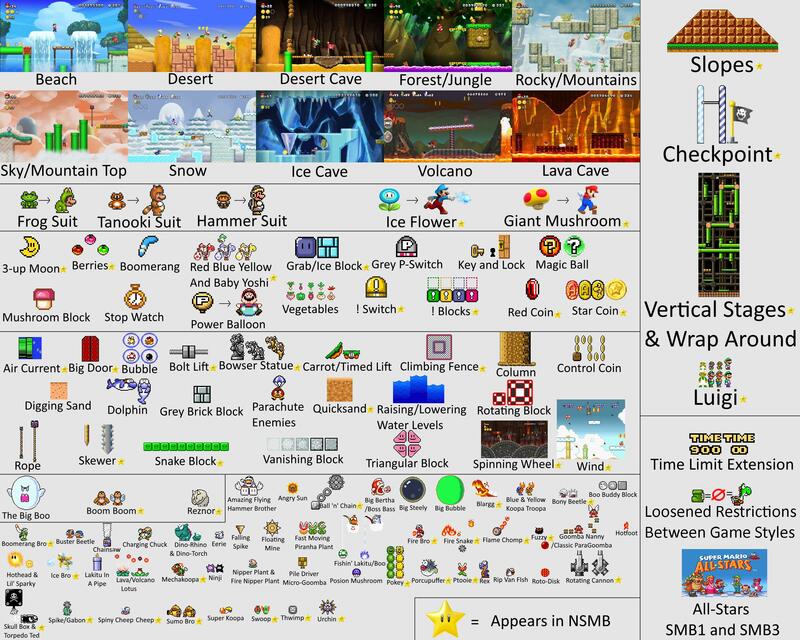 I feel like Mario is one of the only games you could just memorize something like that. Moving platforms is cool to unlock, as is fire power and 1ups (even if they're fairly pointless in this release), but I'm surprised Lakitu is unlocked already. Seems like he's fairly game breaking. Perhaps the unlocks are coming at us chronologically for simplicity. So far, at least. Holy crap pyxi - are you not supposed to be able to get up on those floating platforms? One time I did, but the next time, I spent about 2 minutes timing the jump to the top one and couldn't get it. Had to kill Lakitu to clear the level. Not sure if that was intentional or not. I did it once, but man I could not figure out what to do the next time! Whatever reason kept the Pokemon characters out of Yarn Yoshi, I doubt it had anything to do with licensing. Nintendo owns Pokemon and The Pokemon Company. Nothing special, just seeing what I could throw together. Not GameFreak anymore? (Shows how long it's been since I Pokemoned). I have 5 friends online right now, 4 of those are playing this title.